As a kid ever liked scramble eggs, to me they were tasteless and dry. One morning I awoke to a Delicious, but unusual aroma flowing though the house, which I followed into the kitchen. There our new housekeeper/babysitter was making breakfast for us kids. Peering into the skillet and seeing strange color scramble eggs, my first thoughts were yuck! what's that I asked, The new babysitter/housekeeper, who's name is Rosa, answered "that's scramble eggs with chorizo". Try it you just might like it ,she said. and convinced me to give the eggs a taste. Hum well I guess these strange eggs are not so bad. Rosa,was a great home cook, and in the time she spend with our family, she introduced my taste buds to lots of new flavors and dishes... I love chroizo with eggs and/or with potatoes,. 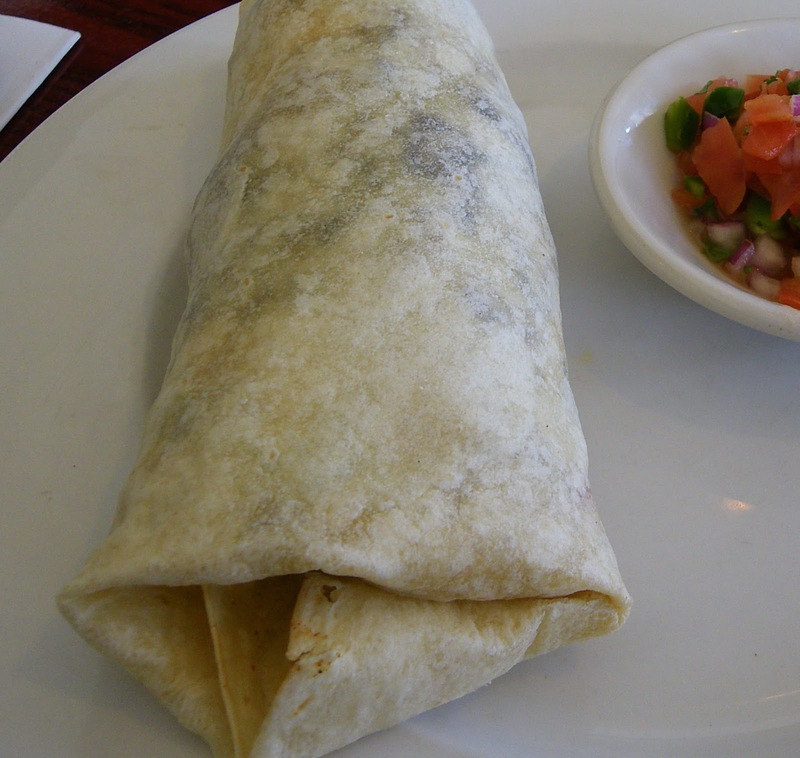 especially like this breakfast burrito. I make myself a Breakfast burrito once or twice a week. Great because they er easy and quick to make, as well very satisfying. Plus! 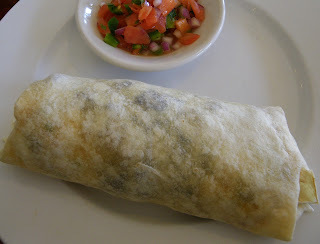 you can eat half for breakfast and then wrap up the other half and take for lunch. 16 oz. Fresh Chorizo sausage,casting removed. 3 cups diced cooked red potatoes with onions and peppers,or frozen diced hash browns with onions and peppers. In a large skillet cook chorizo over medium -high heat until meat crumbles and is lightly browned . With slotted spoon, remove Chorizo from pan. Drain all but 2 tablespoons drippings from pan.Then return Chroizo to pan. Add potatoes, and cook stirring often for 10 to 15 min. or until lightly brown. In a medium bowl whisk together eggs and milk. add beaten egg mixture to skillet, and cook stirring occasionally 6-8 min. or until eggs are cooked.. Remove from heat, stir in cheese and cilantro. Place tortillas on a work surface. 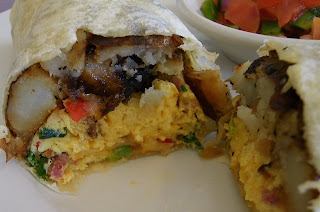 divide egg mixture evenly among tortillas. I love making breakfast burritos ahead of time to heat up in the oven when I want one. I'm going to give your recipe a try :) Thanks for sharing! can i use sausages instead of chorizos? Hi Deanna and thanks for following my blog! I'm following you too! This looks yummy, I haven't had chorizo in forever but I sure do love it! Yummy! I need to pick up some chorizo, so we could add it to our breakfast burritos. Thank you for sharing and for linking up at this week’s Harvest of Friends Weekend Blog Hop! Yum! I love breafast burritos and this one looks delish! I love chorizo and eggs. So very yummy. I hadn't had them in years until last year when our staff went on a retreat and our boss and her husband made us chorizo breakfast burritos. No potatoes though. I like that. :) Have a lovely weekend! Oh good! I found you! And also apparently a great recipe! I happen to have all the ingredients right now - including the chorizo, so I think I'm just going to have breakfast-for-dinner tomorrow night! Looks like a fun meal, Deanna Lyn! Thanks for sharing at Foodie Friends Friday Linky Party!